This article is derived directly from Bruns' article, Working toward a North American Mycobiota for macrofungi — what’s stopping us? (page 1), in the August issue of Inoculum, the Mycological Society of America's (MSA) newsletter. We have reworked it here for the McIlvainea audience because we felt that it was important to communicate these ideas to a broad cross-section to the mycological community. There is also an earlier Inoculum column by Matheny and Vellinga (2009), A North American Flora for Mushroom-Forming Fungi (page 28), that expresses many of the same points and is worth your time to read. Our intent with this article is to point out the value in having a comprehensive mycoflora for the continent, and to begin to outline the steps needed to achieve it. So what is a mycoflora (or mycobiota, mycota, or funga if you prefer), and how does it differ from a field guide? Plant floras are really the models for these questions. If we take the examples of floras like the Jepson Manual, the Flora of the Pacific Northwest, or Gray's Manual of Botany, we see that floras are much more comprehensive than field guides in that they strive to include all known species in a region. Each species is keyed out and described in more detail than is usually found in a field guide. Floras include distribution data that are based on vouchered specimens, provide information on which species are native to a region versus which are alien, include basic information on the habitats where species are commonly found, and do all of this in a more comprehensive fashion than field guides. The comprehensive nature of a mycoflora would provide an unparalleled tool for identification, and it would be a repository of distribution data for all the species. A mycoflora would essentially be a collection of monographs; it would have to be multi-authored, so that experts on particular groups wrote the appropriate sections, but it would also have to be thoroughly edited so formats were uniform and keys worked well. Beyond identification, one of the main values of a mycoflora would be the access to the distribution data. Currently we have only a vague notion about fungal species distributions. Assembling real distribution data on fungal species will likely reveal shared patterns of distributions, much like we see in plants. For example there are probably distinct mycofloras in many regions of the continent (e.g., Pacific Northwest, Southeast, Midwest, Southwest, Boreal, etc.). The regional mycofloras comprise both different assemblages of widespread species and endemic elements. Some, perhaps most, of the widespread species may involve cryptic species that appear to be the same but are genetically different. Why Don't we have a North American Mycoflora? If a mycoflora is such a valuable tool, why hasn't a modern one been written already (we're ignoring lichens where there is a good floristic treatment, Brodo & Sharnoff, 2001). Unfortunately the answer to this is rather obvious: the basic information is not available. Most of the monographs have not been done. Another obvious problem for assembling mycofloristic data is that there are very few mycologists versus a large number of fungi. Estimates of fungal numbers were originally based on a ratio of six species of fungus for every one vascular plant in Europe (Hawksworth, 1990). This ratio now looks conservative (Hawksworth, 2001), particularly when tropic regions are included (Frolich & Hyde, 1999). Thus from an organism perspective alone the job of assembling a mycoflora is very conservatively six times more difficult than the job of assembling a flora. But the problem of being outnumbered by the organisms is further exacerbated by the small number of mycologists. To get a rough estimate of the problem we can use the 1:5 ratio of mycologist to botanists based on MSA to BSA membership numbers. Combining these two numbers means that we have a ratio of organism to scientists that is about 30 times worse than that of plants and botanists! The problem does get better if we limit our sights to only macrofungi, essentially the mushrooms, polypores, truffles, corticoid fungi, and Ascomycota with large sporocarps. We think limiting the problem in this way is the only practical way to proceed in the short-term. As we will argue below, we are going to need the public for this effort, and we think that that requirement will make assembling distribution data on microfungi impractical. Producing the data for a mycoflora is difficult since fungal fruiting is often short in duration or unpredictable, and many species appear to be rare. But we do have at least three factors that have developed in recent years that will help us: 1) there are much better field guides (to mushrooms) then there were a couple decades ago, 2) the internet allows instant access to distributed data and allows one to deposit image-rich descriptions, and 3) obtaining nucleic acid sequences is now cheap and easy. With these tools, lots of help from people like you, and some coordination, we think we could start to make some real progress on a continental mycoflora at least for the macrofungi. Ultimately, we need some serious funding for this, a point we will return to, but even with minimal funds we can get started. There are at least three elements that we will need to start assembling a mycoflora. First, professional mycologists and informed public absolutely have to work together on this; there are simply not enough professional mycologists to accomplish this task (see above). Other countries, such as the Netherlands, Switzerland, and Germany, (Anon., 2000; Anon., 2006; Kriegsteiner, 1991; Nauta & Vellinga, 1995) have already embraced this approach. Here with NAMA and all of its associated local organizations that are already engaged in collecting and identifying, it seems like all we need is some added organization. In the lingo of the National Science Foundation you are "citizen scientists", and many of you are highly competent taxonomists. Are you ready to work together on this? Second, this must be a specimen-based effort and specimens must be coupled to at least basic metadata (location, date, habitat, specimen notes). Foray lists or Mushroom Observer posts, even when supplemented with good photos, are not sufficient evidence for the presence of most species. Dr. Barbara Ertter, who worked on the Jepson Manual (a flora for California), summarized this best when she said: "without a specimen, it's a rumor". Specimens provide the necessary ground truth that can be reexamined as species concepts change; without them we stand on weak ground. However, the requirement for specimens adds two additional complexities to the problem: curation and herbarium space. These are respectively time-consuming and in increasingly short supply. NAMA has foray lists going back 50 years to 1961 and has kept vouchers for each annual foray since 1997 (Leacock, et al, undated). So this is a great start. But funding cuts at the Field Museum of Natural History in Chicago have meant the departure of both of the mycologists who had overseen the curation work so we are losing even that one tiny three-day annual window at one rotating place in North America. Meanwhile the Pacific Northwest Key Council is trying to improve our knowledge of the fungi of the Pacific Northwest by documenting and curating collections from their annual spring and fall forays. However, each year they have to find a herbarium willing to take the collections for that year and volunteers willing to document and dry the material and see that it is deposited in a herbarium. Third, nucleotide sequencing is a must. In fact for fungi we could modify Dr. Ertter's motto to "without a specimen and a sequence, it's a rumor". Most of our fungal diversity probably resides in difficult species complexes, and it is at this level where regional differences in the mycoflora are likely to be most numerous. The fastest and most objective way to sort out these complexes is with sequence analyses. Deposited sequences are also an easy way for those doing monographic work to screen for collections that might be of special interest. Ideally sequencing would be a multilocus process, but even if we started with a single locus (like ITS) it will greatly aid in the process of sorting out species. Fortunately, there are some really easy DNA sampling, preservation and extraction methods now available (Dentinger, et al, 2010) that are very well suited to this goal, and the price for sequencing continues to drop. What can we do with little or no funding? We can certainly start to organize, by improving connections between professional mycologists and citizen scientists. We can do this by using existing web technologies such as the Mushroom Observer and Google Docs to help report and coordinate efforts within and between groups, and if spare funds are available, we can start to sequence through the collections. Bruns' involvement with this approach started when David Rust, a co-founder of the Bay Area Mycological Society (BAMS), approached him and asked what local mushroom clubs could do to contribute to science. His question came on the heels of the Asheville, NC joint NAMA-MSA meeting, where the "mycoblitz" of the Great Smoky Mountains National Park had occurred. So using the mycoblitz as our model we started a survey of the macrofungi of Pt Reyes National Seashore. This has been an ongoing project for several years and has now expanded to Yosemite National Park. It has been a very rewarding experience that provided a great excuse to learn many fungi, and it has helped two national parks to start cataloguing their fungi. In Pt. Reyes we have now increased the known number of fungi in the park by over four-fold, and in Yosemite we doubled the number of known fungi in a single year; this says a lot about how little the parks knew, but it also says a lot about what can be done with a shoe-string budget and some hardworking volunteers. This work was primarily driven by members of the public, who did most of the collecting and identifying, helped produce web content1, and helped curate the specimens (Fig. 1). We have started to sequence these collections with help from Mike Davis (UC Davis) and with a series of undergraduate projects at Berkeley. The results have revealed many novel fungi even among common species that we thought we knew. Many other similar surveys are going on across the continent. Jean Bérubé (Research Scientist, Canadian Forest Service) has been involved with a project to survey the mycoflora of Québec for the last several years. This project is being done in collaboration with Cercle des Mycologues Amateurs de Québec and Cercle des Mycologues de Montréal and Mycoquébec, and involves weekly forays, voucher collections and sequencing. In two years they have managed to collect 1210 specimens representing 781 species. In an email response to our questions about this project Bérubé underlined the role of the public when he wrote, "without the collaboration of mycological clubs and citizen scientists, this work would be impossible. They assume more than 90% of the task and their expertise is irreplaceable." The Pacific Northwest Key Council recently (June 2011) accepted Jim Johnson’s (Central Washington University) proposal to help study the mushrooms of the Cle Elum Ranger District of the Snoqualmie National Forest by assisting with collection and description of the fungi while he and his students do the DNA work using funding from the U.S. Forest Service. What could we do if the mycological community had funds to produce a North American mycoflora for macrofungi? Here is our short list: 1) digitize all major fungal herbaria in a way that allows a single search to retrieve records for all available collections; 2) pay for travel for people to collect in different areas of the continent, and to participate in targeted forays; 3) pay for expanding and centralizing DNA extraction and sequencing, and give trained members of the public access to it; 4) pay for training workshops on collecting, describing, and identifying mushrooms in taxonomically difficult groups; 5) pay for curation of newly collected specimens; 6) develop a wiki-style website for the North American Mycoflora that would coordinate the data, display distributions, and provide identification tools for all taxa; 7) organize and coordinate the writing, by hiring a staff and by supporting experts to write the individual sections; and 8) begin expanding to the microfungi. To do the job right would require at least 18 million dollars over 15 years2, with the money being distributed across six regional centers. Where is this level of funding going to come from? The Consortium for the Barcoding of Life would be a likely source for some of the sequencing, but we think this would represent a relatively small portion of the cost. The National Science Foundation (NSF) might pay for some of it. In fact they just funded a proposal, by Barbara Thiers, to digitize all the major mycological collections in the US! This will allow one to at least assemble the existing data. In addition the "citizen science" aspect of the mycoflora work could be easily incorporated into existing grants as part of the "Broader Impacts" section that is geared toward outreach. But these pieces of the funding need do not begin to approach what is needed for the whole project and it is unlikely that NSF would ever target 18 million dollars to assemble a North American mycoflora, especially in the current funding climate (ditto USDA, DOE, NIH, EPA, DOD, or any other federal funding agency). Smaller foundations might also be able to fill in part of the funding. The Daniel E. Stuntz Memorial Foundation, a small regional foundation in Seattle, Washington founded in honor of the mycologist Daniel Stuntz is one example. Other similar sources need to be explored. Would NAMA and MSA be willing to establish dedicated endowments to accept donations towards developing a mycoflora for North America? Where does this leave us? It leaves us in the position of doing the best we can with limited funding, while looking for substantial private investment. We have little experience with private funding, but we do see major foundations that have the kind of money necessary, and if we can actually get through the door to make our case we would stand a good chance of getting this long overdue project moving more quickly. We would be happy to hear from anyone that has experience or ideas along these lines. In the meantime, what we need to do is to get organized. Coordinate surveys in your area that are based on vouchered material, and team up the professionals for specialized needs like sequencing. But let's get going on it! 1Mike Wood, of the Mycological Society of San Francisco, helped design the Pt. Reyes Mycoblitz website, and Debbie Viess, of the Bay Area Mycological Society, provided text to the Point Reyes National Seashore that is now on that park's website. 2This number comes from a funding level of $200,000/center/year x 6 centers. This would be enough to hire a person to coordinate the logistics, pay for help with specimen curation, and provide travel and supply money for the project. Anonymous. 2000. Verspreidingsatlas. Kaartenbijlage overzicht van de paddestoelen in Nederland. Deel I. Agaricales., (Nederlandse Mycologische Vereniging). Anonymous. 2006. Swissfungi online: Verbreitungsatlas der Pilze der Schweiz. Brodo, I. M., S.D. Sharnoff, & S, S. Sharnoff. 2001. Lichens of North America. (Yale University Press). Dentinger, B. T. M., S. Margaritescu & J.M. Moncalvo. 2010. Rapid and reliable high-throughput methods of DNA extraction for use in barcoding and molecular systematics of mushrooms. Molecular Ecology Resources. Molecular Ecology Resources 10, 628-633. Frohlich, J. & K.D. Hyde. 1999. Biodiversity of palm fungi in the tropics: are global fungal diversity estimates realistic? Biodiversity & Conservation 8, 977-1004. Hawksworth, D. L. 1990. The fungal dimension of biodiversity: magnitude, significance, and conservation. Mycol. Res. 95, 641-655. Hawksworth, D. L. 2001. The magnitude of fungal diversity: the 1.5 million species estimate revisited. Mycological Research 105, 1422-1432. Krieglsteiner, J. G. 1991. Verbreitungsatlas der Grosspilze Deutschlands (West). (Ulmer). Leacock, P.R., D.P. Davis, and G.M. Mueller. Undated. Utilizing Foray Records to Document Fungal Diversity across North America. Matheny, P. B. & E.C. Vellinga. 2009. A North American Flora for mushroom-forming fungi. Inoculum 60(5), 28-29. Nauta, M. M. & E.C. Vellinga, 1995. Atlas van paddestoelen in Nederland. (Balkema). Pringle, A. & E.C. Vellinga, 2006. Last chance to know? Using literature to explore the biogeography and invasion biology of the death cap mushroom Amanita phalloides (Vaill. Ex fr. : Fr.) link. Biological Invasions 8, 1131-1144. Figure 1. 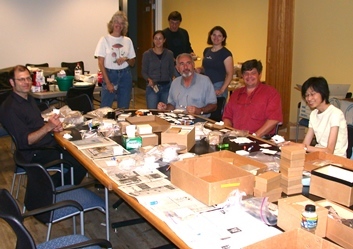 A curation "party" in which members of the Bay Area Mycological Society and Tom Bruns’ lab group helped to box and label collections from the Point Reyes "mycoblitz” forays. Not shown are the many people from the Mycological Society of San Francisco, Sonoma County Mycological Association, and the Fungus Federation of Santa Cruz who were responsible for many of the collections and identifications. Figure 2. 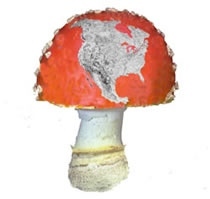 A logo for the North American Mycoflora Project. This is derived from a photo shop altered photo from Taylor Lockwood that Mike Wood posted on Mycoweb with a Google Earth projection of North America. We will try to add back New Foundland and Victoria Island when we update this.